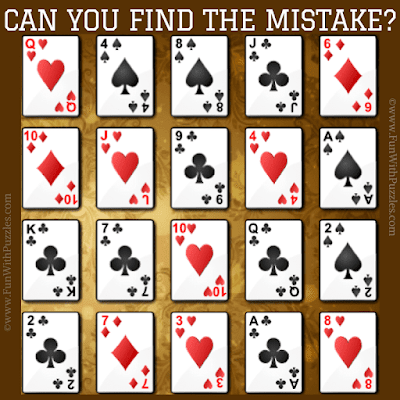 Fun With Puzzles Brain Teasers Find the Mistake Picture Puzzles Puzzles Puzzles for Teens Can you find the error in this picture? Can you find the error in this picture? 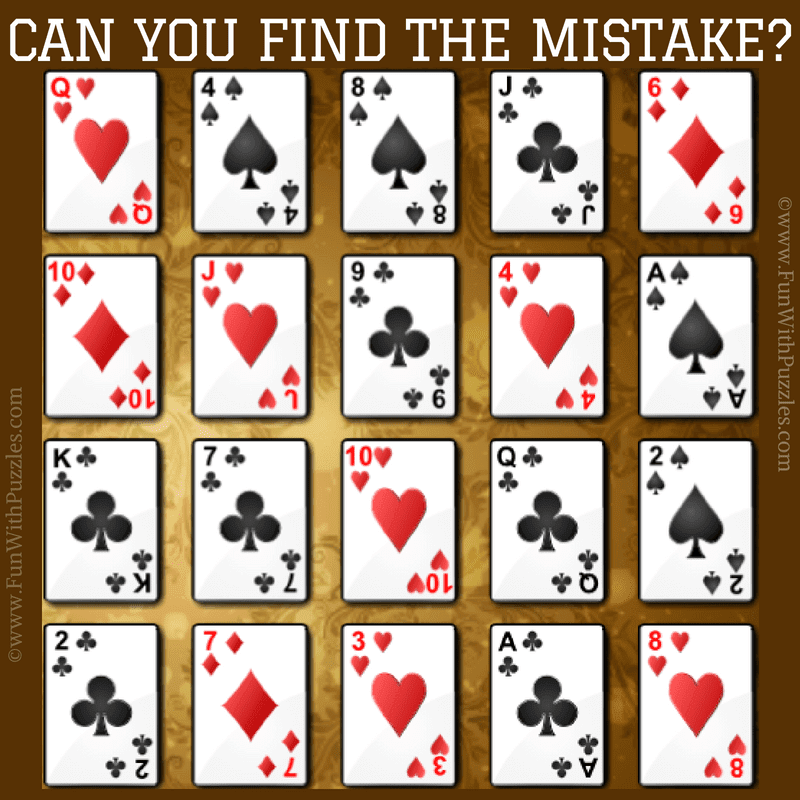 This error finding picture puzzle dedicated to game of Poker Square. In this picture riddle, there is snapshot taken from Poker Square Card Game which contains one error in one of the cards displayed in the puzzle picture. Can find the error in this picture? Answer of this "Can you find the error in this picture?" puzzle, can be viewed by clicking on button. Please do give your best try before looking at the answer. Poker Square game tests your logical reasoning as well as visual power. Do checkout below mentioned puzzles which will test your Maths skills, Logical Reasoning and Observational power. 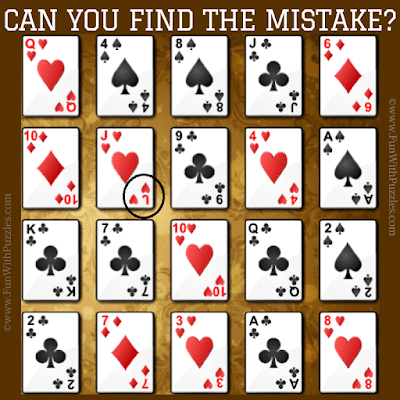 Sudoku Mistake Puzzles: Can you find the mistake? : How good is your observational power. Do test your visual skills by solving the Sudoku mistake puzzles in which your challenge is to find the mistake. Easy Mathematical Brain Teasers with answers For Kids and Teens to Challenge your Brain : These are the easy Maths Brain teasers for kids and school going teens which will challenge their brain. Daily Online Conceptis Puzzles : It contains more than 15 logical puzzles which are updated daily. These puzzles can be solve online. Mathematics Picture Puzzles Riddles for Teens with answers : It contains the Maths Picture puzzles in which teens has to solve the given Mathematical equations.